An innovative, advanced way to moisturize and provide key nutrients to your dog's skin as well as leaving the coat silky smooth and fresh. 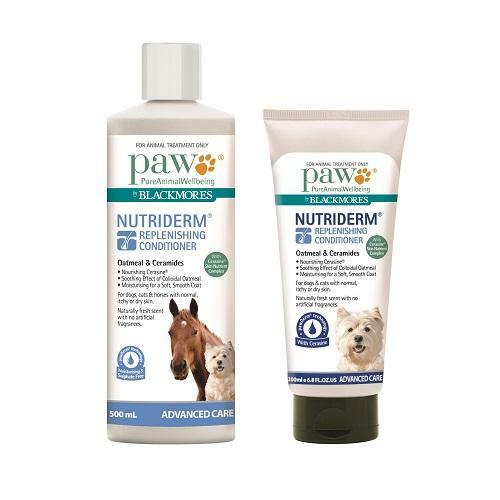 PAW NutriDerm"_ Replenishing Conditioner is an innovative, advanced way to moisturise and provide key nutrients to your dog"_s skin as well as leaving the coat silky smooth and fresh. Containing advanced Cerasine"_ skin nutrient complex this product is suitable for dogs and cats with normal, dry and itchy skin. Cerasine, an innovative skin nutrient complex: with ceramides and essential fatty acids (omega oils) to intensively moisturise the skin for optimal skin hydration and a healthy skin barrier. Colloidal oatmeal: for soothing effect. Moisturising & detangling ingredients for a soft manageable coat. No artificial fragrances for a natural fresh scent. Purified water, behentrimonium methosulfate and cetearyl alcohol, glycerin (vegetable), sorbitol, avena sativa (oat) kernel flour, surfactant, ceramide mixture, jojoba seed oil, avocado oil, shea butter, emollient, panthenol, hydrolysed oats, rosa canina seed extract, preservative, citric acid, sodium gluconate, rosemary leaf extract mixture.